Beginning this May, Ramon Corona will be selling his farm fresh produce at the Monday Española Farmers’ Market, the Tuesday Santa Fe Farmers’ Market, the Thursday Los Alamos Farmers’ Market, and the Friday Eldorado Farmers’ Market. Whew, talk about a big debut! When he’s not at market, you bet he will be planting, weeding and harvesting at the farm in Española that he shares with his dad, Salvador Corona. Ramon has learned to farm from his dad, and this year he decided he was ready to strike out on his own. The first snap peas of the season were gone by the time I got to market on Tuesday, but his spinach was tender and tasty, and the green garlic looked delicious. Next week I am determined to snap up some peas, and if my family is lucky, maybe a few of them will even make it home. Ramon’s smile is almost as big as his dad’s, so be sure you stop by his table and give his food a try the next time you see him at market. 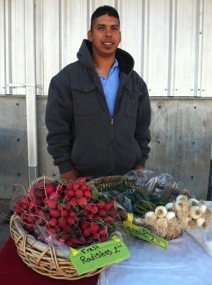 How will Ramon’s first year of farming on his own go? Time and the weather will tell, but I for one want to help this new farmer have a great year!